How are you, dear readers! I have lots of stories to share including my visit to Sky Ranch in Pampanga, our wonderful dinner at Knorr event, Dove's newest campaign #WeAreBeautiful, COOK Magazine's Holiday Bash. I am really excited to tell you more about these all I need is more time and high speed uninterrupted internet connection. Anyhow, let me share some home cleaning tips. I've been using this product for more than a year now and I can say I'm so delighted I found them. I got my first bottle of AMWAY cleanser from my beloved ninang Joyette sometime last year. As I read the label and shake the bottle, I knew it will be one of my favorite multi-purpose cleanser. Indeed, it delivers effectively. 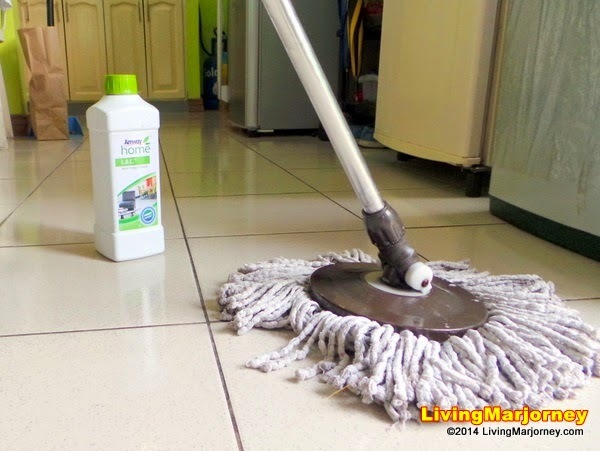 With a single wiping stroke using Amway HOME, the floor cleansed and shiny. It easily removes dirt, dust, mold, grime and grime build-up leaving a mild, fresh scent. I can walk around without wearing slippers afterwards. Most of all, the solution is thick and concentrated. I mix a spoonful in a half of small pail of water. You can also use it to clean your bathroom and kitchen sink. Unlike other cleansers, my bottle of Amway lasts a long time. I started using this bottle same time last year. Would you believe it's been a year and there's about 1/4 remaining. I love home cleaning solutions so imagine my excitement when I received this bottle of stainless cleaner from one of the Electrolux events I attended this year. To my delight, I immediately open it, drop a small amount in a damp cloth and started cleaning our stainless steel stoves and faucets. I was surprised how it change the old looking and finger prints on our faucets. Electrolux Stainless Steel Cleanser even protects stainless steel items at home. I also noticed that stainless steel items cleaned with Electrolux cleaner doesn't easily get dirty, dusty and oily. It works on all stainless steel items at home or in the office so I recommend it. Try and see it for yourself! Amway Multi-purpose cleanser and Electolux Stainless Steel Cleansers are available at Amway and Electrolux offices. Have you ever tried any of the two products featured today? How was your experience?